This vintage embroidered panel was brought to me by Caroline Doran who has requested a mentoring session recently at Heart Space Studios. 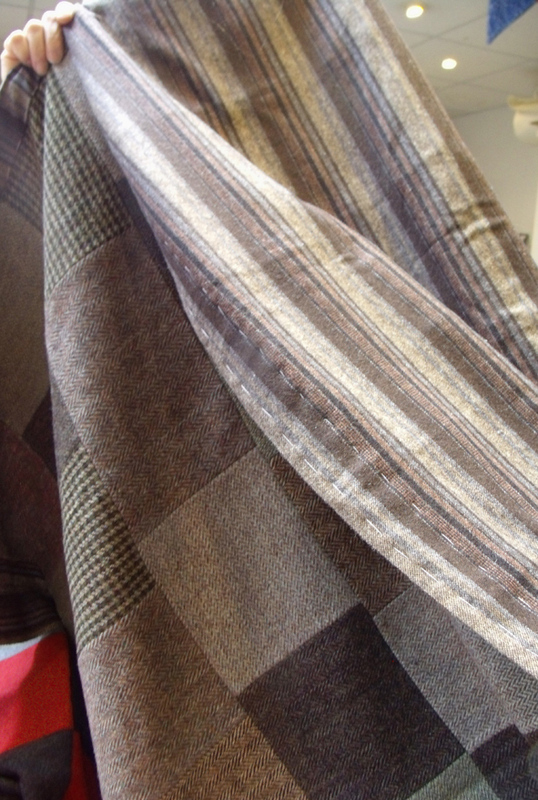 Caroline was a member of our regular Knit and Stitch group who meet each week to talk, work and enjoy textiles together. 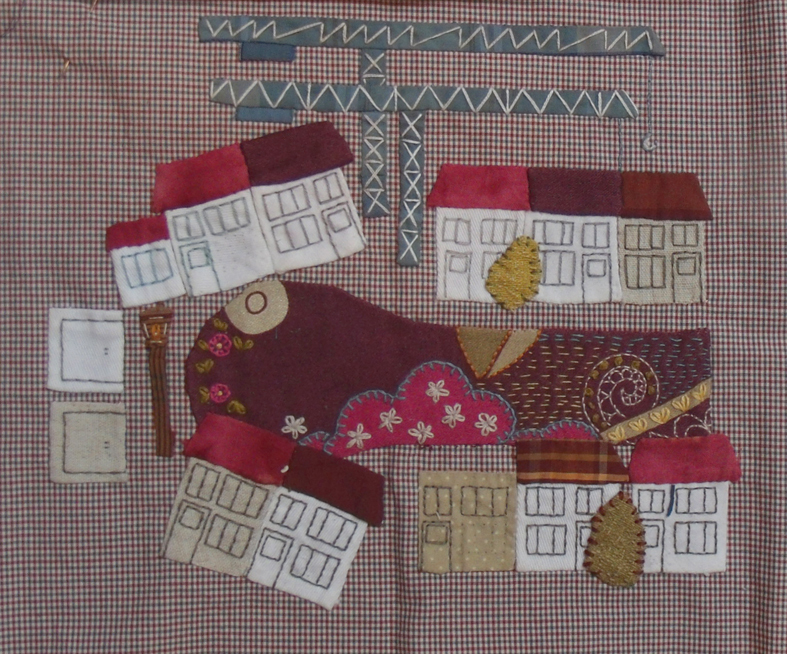 The last time I had seen her she had brought a small hand embroidery she was working on, it was of her own neighbourhood with some enormous cranes from a local building site – she had asked me for some advice on windows . 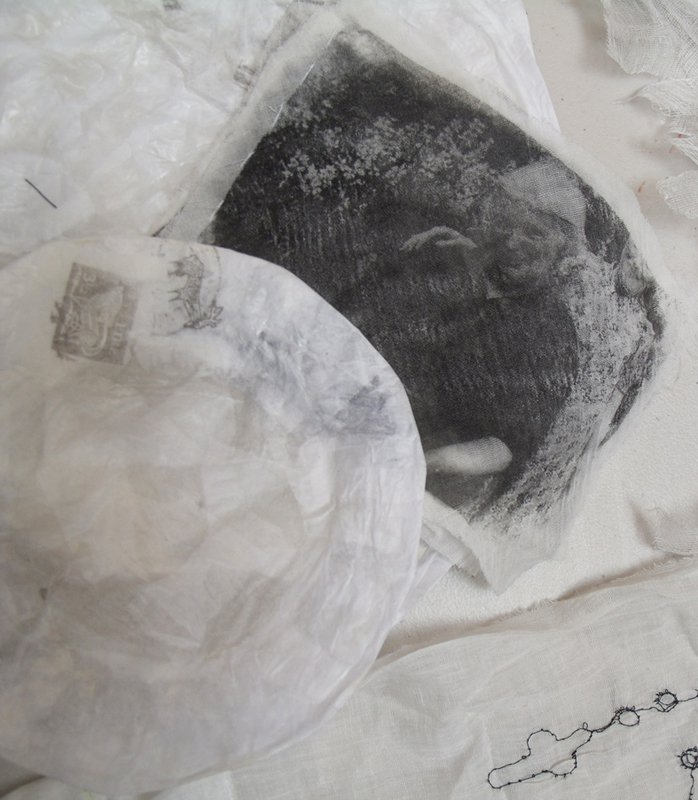 I remember discussing the work at length, which looked really very promising …then I didn’t see her for several months! 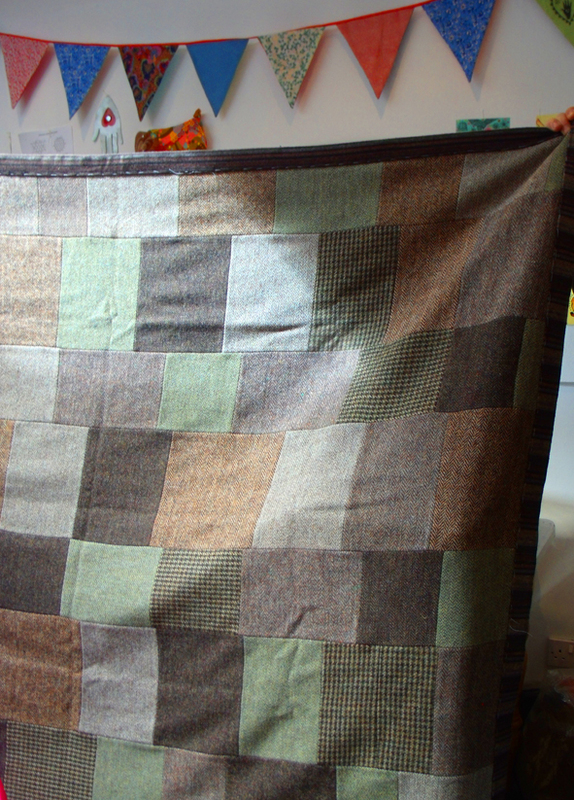 However she turned up again asking if I could review her work as she was a bit “stuck” : how well I know what that feels like…” is this piece worth going on with? What am I doing this work for? Why can’t I seem to keep going with the same momentum I started off with? Have I any other better ideas? We all experience this doubt when we make work that is slow going, you just have to keep stitching but it helps if you have some record of the why as well as the way the work came to be made – research – for want of a better word. 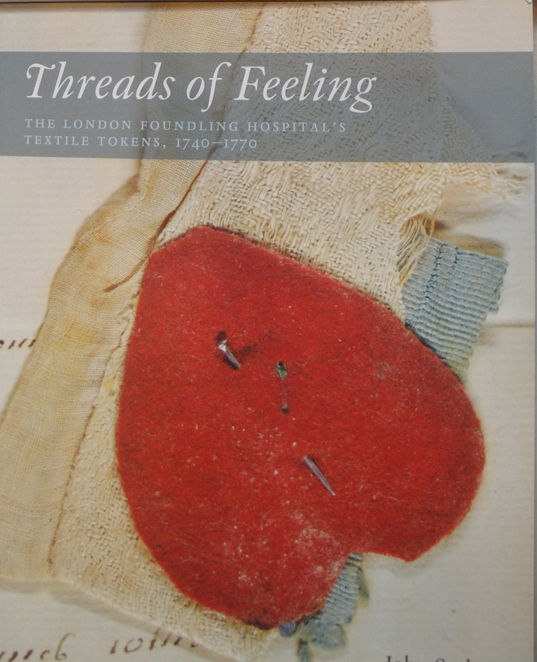 She also brought in several books, by other embroiderers who use applique and patchwork, notably Janet Bolton, but also the catalogue from the London Foundling Hospital about the mementoes left by mothers with the children they had entrusted to the future to the care of the institution. There is a very strong set of images and ideas being laid out before me. I was very intrigued to see what other work she had brought in to show me. 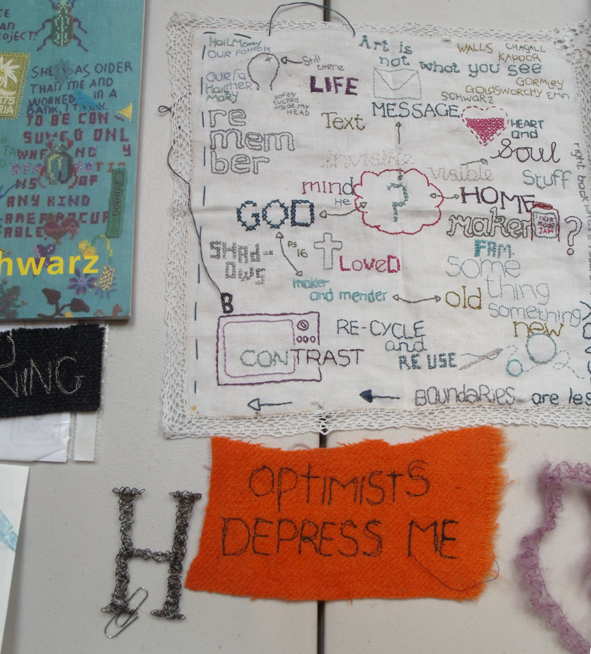 A few years ago Caroline had undertaken an arts foundation course and she also brought along some of the work that she thought was still relevant to her now. I find that the great breadth of foundation courses are brilliant for introducing students to a wide range of ideas and media but after a few years ‘at home alone’ the personal and, let’s face it, the available will re-assert itself. This situation can lead people to feel that they are not being adventurous, or the work doesn’t count as it is made of such mundane materials. 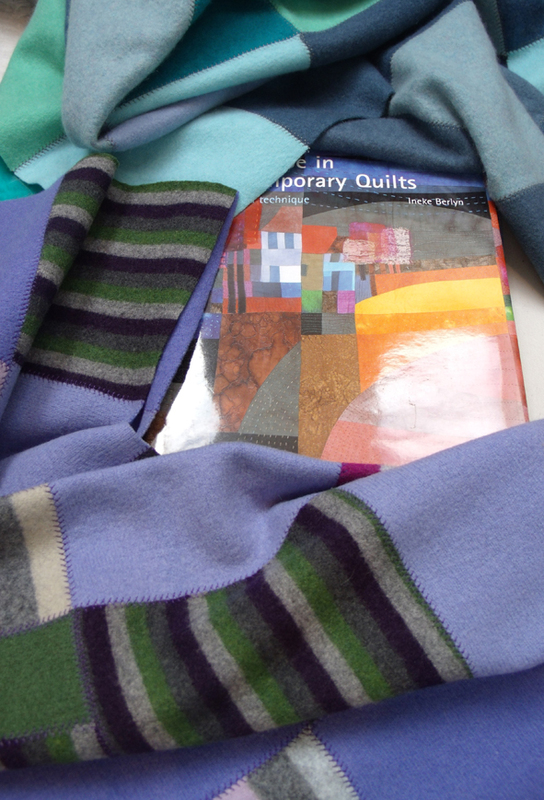 But I think that this is the real strength of textile practice, for the most part it can be made using materials that are readily available, and these materials are the stuff of everyone’s lives and so are have many and varied associations with which to connect – for both makers and viewers. One thing that good foundation courses do give students is a sure sense of self-critical analysis, and this Caroline had acquired, if anything she was too critical, getting things ” too perfect” had rendered much of her latest work a bit lifeless, and she knew this – but how to remedy this is part of why she has come to me for help. 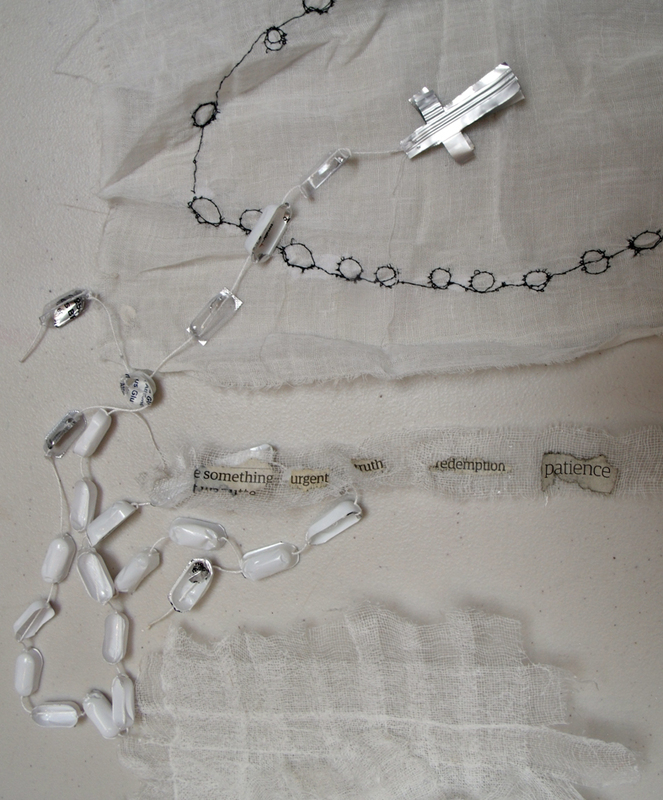 so wasn’t surprised when her grandmother’s real rosary turned up stitched onto a piece of work. 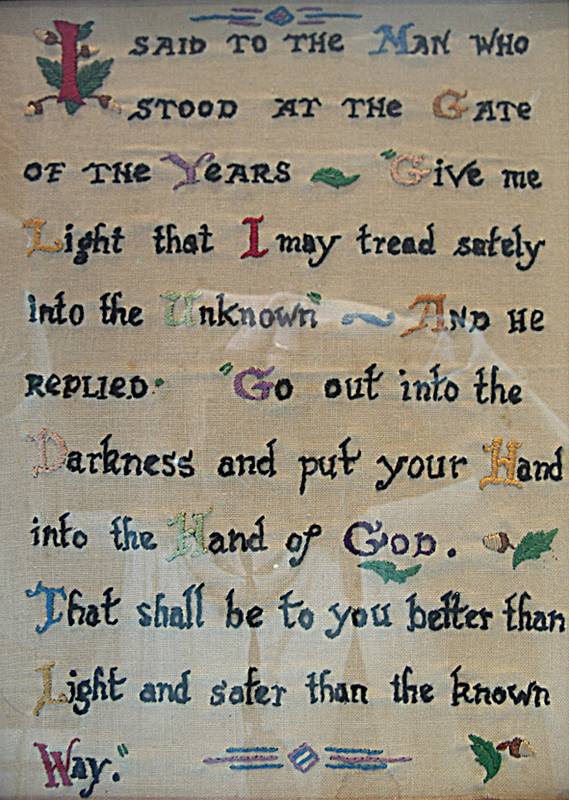 I was beginning to see the connection between the vintage embroidered verse – almost a prayer – that had come as piece of inspiration, with this almost sacred treatment of her Irish heritage. I started to ask about this connection and heard how Caroline still felt deeply connected to her Irish roots, still retained a religious faith and was now concerned with working with evidence of her family background, maybe using photographs, maps and other found objects. 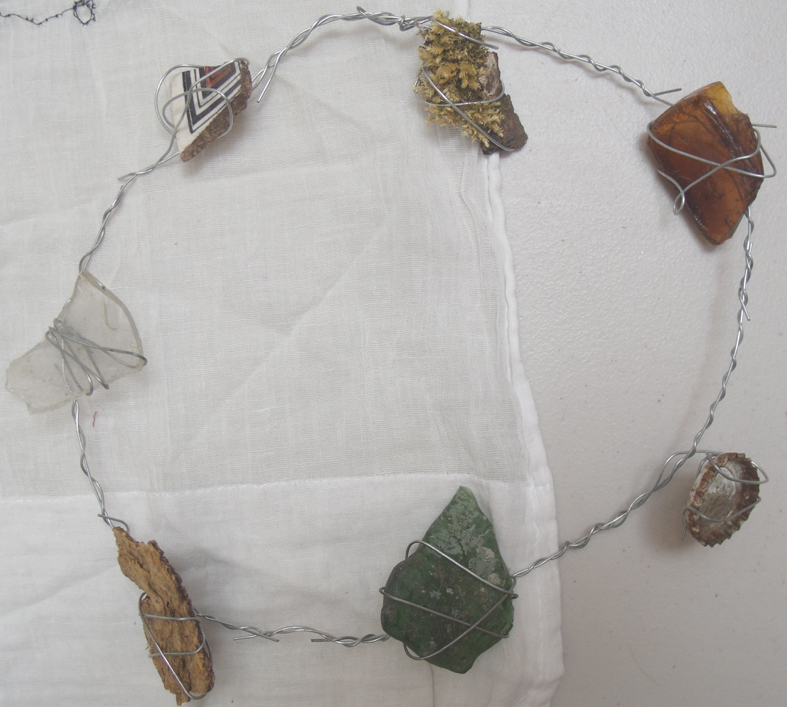 The most arresting piece that she showed me from this set of work was literally found – on a land fill site where she had made a necklace from shards of broken glass, pottery and stones – again a sort of secular rosary ….regarding or touching the objects made the viewer consider other lives, other places, tiles, bottle caps, lichen, glass, bark….. 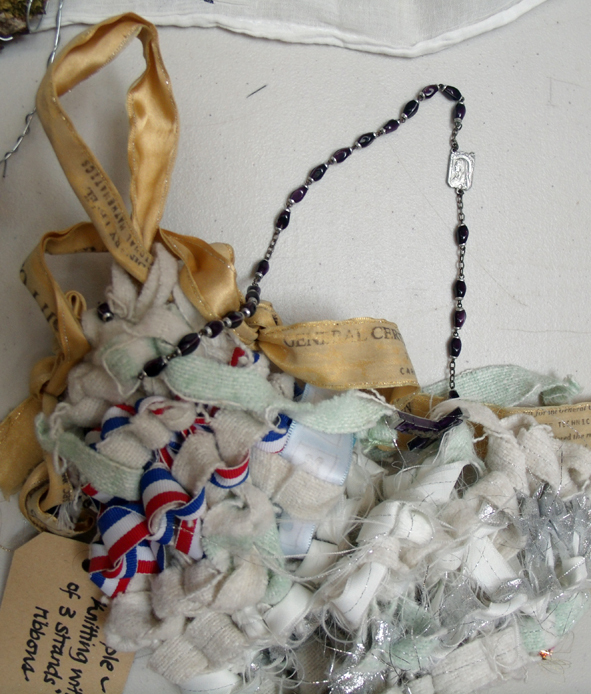 I was now considering how to help develop these disparate sets of materials and concerns into a more cohesive textile context, obviously some form of collage, applique or mixed media patchwork….when, as sometimes happens at the studios, we had 2 visitors from ‘Billie Jean’ which is a lively Bristol vintage clothes and fabric shop, they had been sent to us to show some things that we might be interested in seeing; and these were….. patchworks. 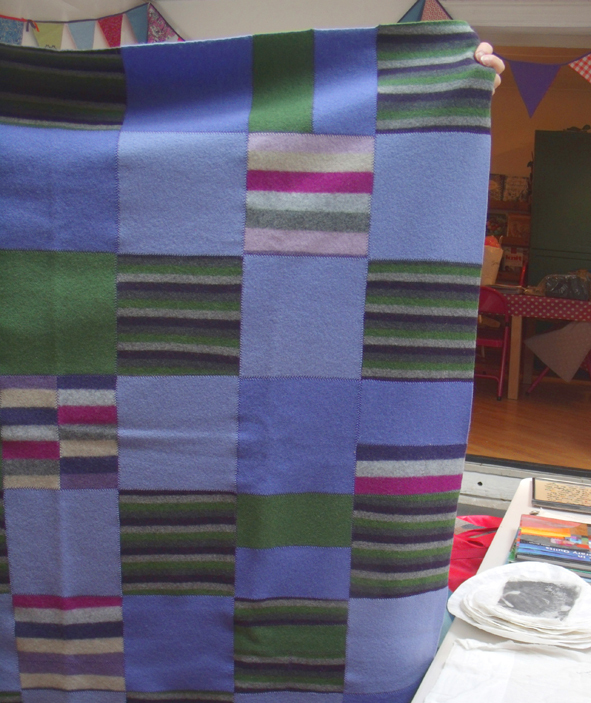 Asking Caroline’s permission, I invited them in to see some absolutely lovely recycled tweed and knitted cashmere patch-worked blankets, that Billie Jean herself had made from their stash of old cashmere knitwear and woolen jackets, we were soon all chatting away about recycling, the beauty of old fabrics and how much we enjoyed the experience of just handling and making with textiles. 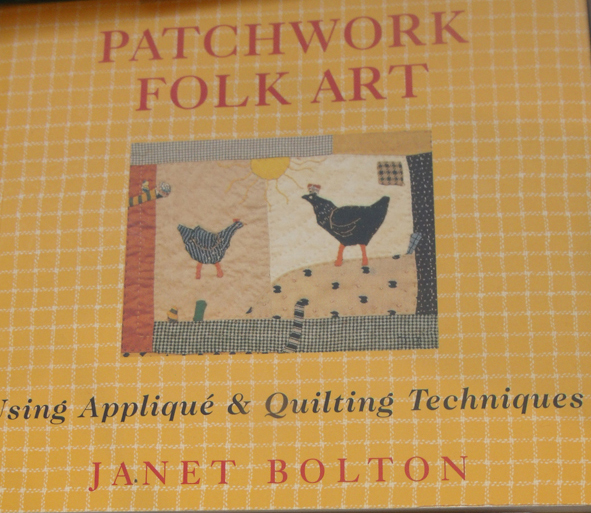 And as several of Caroline’s inspirational books had been about patchwork and applique, this seemed to be a good omen for the way to go…..as part of the mentoring session we now had to decide the way forward. I advise people how they might develop the next stage of their work, it is entirely up to them if they choose to take that advice. I see my mentoring role to be that of a person immersed in the same materials, techniques and often similar subjects as the people asking advice, and having been through similar making (or not making) experiences many times I have developed several strategies for looking at the work, getting some perspective on it – finding connections and as any tutor will do – suggesting new things to research to take the work forward. We now had to look at what was in front of us, decide what was to be developed immediately, what could be parked for working on later when there had been more time for fresh research, and what could be safely consigned to a folder or file of past experience. 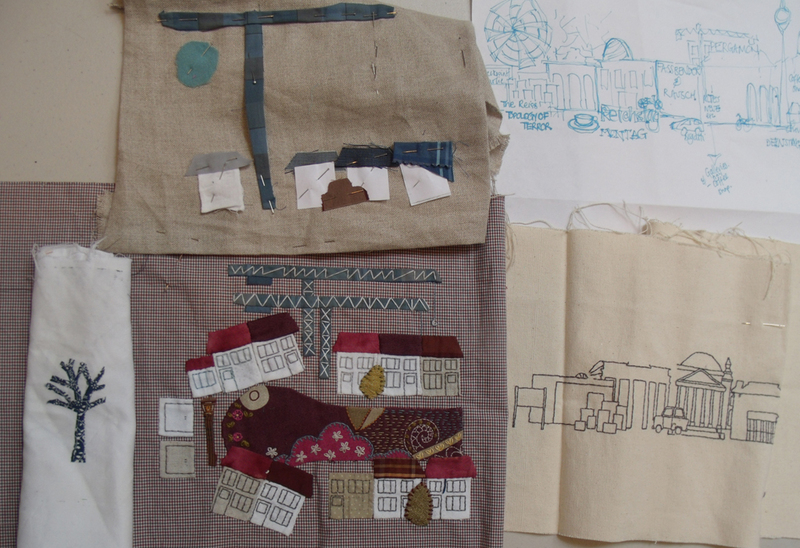 I had grouped several half – worked embroideries and drawings together, they seemed to relate to a celebration of the city and street life, I liked their vivacity and thought that they could be somehow ganged up together to make a larger patchwork piece. 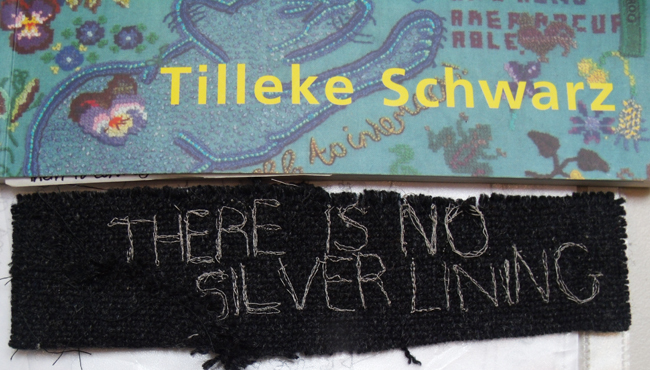 This means they have to be somehow made to work together, more of the simple line drawings can be assimilated worked as appliques or linear stitching and as made into a textile map of Caroline’s geographical space. We will wait to see if she brings anything back to me in the month ahead. I am considering developing mentoring as part of Heart Space Studios activities…so I do hope that she has gained some benefit from this initial session. Categories: Heart Space Studios, Mentoring | Tags: creativity, culture | Permalink.